It was a bleached-bone afternoon with a cloudless sky and a monstrous sun. The air trembled like a mass of gelatinous ectoplasm. No wind blew. Through the swelter came a worn, black Plymouth, coughing and belching white smoke from beneath its hood. It wheezed twice, backfired loudly, died by the side of the road. The driver got out and went around to the hood. He was a man in the hard winter years of life, with dead, brown hair and a heavy belly riding his hips. His shirt was open to the navel, the sleeves rolled up past his elbows. The hair on his chest and arms was gray. A younger man climbed out on the passenger side, went around front too. Yellow sweat‑explosions stained the pits of his white shirt. An unfastened, striped tie was draped over his neck like a pet snake that had died in its sleep. “Well?” the younger man asked. The old man said nothing. He opened the hood. A calliope note of steam blew out from the radiator in a white puff, rose to the sky, turned clear. “Damn,” the old man said, and he kicked the bumper of the Plymouth as if he were kicking a foe in the teeth. He got little satisfaction out of the action, just a nasty scuff on his brown wingtip and a jar to his ankle that hurt like hell. “Well?” the young man repeated. “Someone is bound to come along,” the young man said. “Maybe. Maybe not. Who else takes these cutoffs? The main highway, that’s where everyone is. Not this little no-account shortcut.” He finished by glaring at the young man. “Yeah, yeah,” the old man said, as if this were something he didn’t want to hear. He turned to look up the highway. No cars. No trucks. Just heat waves and miles of empty concrete in sight. They seated themselves on the hot ground with their backs to the car. That way it provided some shade — but not much. They sipped on a jug of lukewarm water from the Plymouth and spoke little until the sun fell down. By then they had both mellowed a bit. The heat had vacated the sands and the desert chill had settled in. Where the warmth had made the pair snappy, the cold drew them together. The old man buttoned his shirt and rolled down his sleeves while the young man rummaged a sweater out of the back seat. He put the sweater on, sat back down. “I’m sorry about this,” he said suddenly. “And I thought I was going to have an easy summer job,” the young man said. They sat quietly for a moment, welded in silence. Night had full grip on the desert now. A mammoth gold moon and billions of stars cast a whitish glow from eons away. The wind picked up. The sand shifted, found new places to lie down. The undulations of it, slow and easy, were reminiscent of the midnight sea. The young man, who had crossed the Atlantic by ship once, said as much. could see. High up and low down to the ground. “Well, it’s something to think about,” the young man managed. The old man grinned at him. “I don’t blame you for thinking what you’re thinking. But this happened to me twenty years ago and I’ve never forgotten it. I saw those fish for a good hour before they disappeared. A Navajo came along in an old pickup right after and I bummed a ride into town with him. I told him what I’d seen. He just looked at me and grunted. But I could tell he knew what I was talking about. He’d seen it too, and probably not for the first time. The young man didn’t know what to say. They sat awhile longer with the desert night, and the old man took his false teeth out and poured some of the warm water on them to clean them of coffee and cigarette residue. “I hope we don’t need that water,” the young man said. “You’re right. Stupid of me! We’ll sleep awhile, start walking before daylight. It’s not too far to the next town. Ten miles at best.” He put his teeth back in. No fish came. They did not discuss it. They crawled inside the car, the young man in the front seat, the old man in the back. They used their spare clothes to bundle under, to pad out the cold fingers of the night. Near midnight the old man came awake suddenly and lay with his hands behind his head and looked up and out the window opposite him, studied the crisp desert sky. And a fish swam by. Long and lean and speckled with all the colors of the world, flicking its tail as if in goodbye. Then it was gone. The old man sat up. Outside, all about, were the fish — all sizes, colors, and shapes. The young man sat up. His mouth fell open. His eyes bloated. Around and around the car, faster and faster in whirls of dark color, swam all manner of fish. The old man reached for the door handle, but before he could pull it a fish swam lazily through the back window glass, swirled about the car, once, twice, passed through the old man’s chest, whipped up and went out through the roof. The young man, his mouth still agape, opened his door and got out. Even high up he could see the fish. Strange fish, like nothing he’d ever seen pictures of or imagined. They flitted and skirted about like flashes of light. As he looked up, he saw, nearing the moon, a big dark cloud. The only cloud in the sky. That cloud tied him to reality suddenly, and he thanked the heavens for it. Normal things still happened. The whole world had not gone insane. After a moment the old man quit hopping among the fish and came out to lean on the car and hold his hand to his fluttering chest. And the younger man had to admit that he felt it, that inner rolling rhythm that is the tide of life and the pulsating heart of the sea. The old man started removing his clothes. “I won’t look at the car,” the old man yelled, running across the sand, trailing the last of his clothes behind him. He bounced about the desert like a jackrabbit. The young man called the old man’s name. The old man did not seem to hear. “I want to leave here!” the old man yelled. Suddenly he was springing about again. “The teeth!” he yelled. “It’s the teeth. Dentist, science, foo!” He punched a hand into his mouth, plucked the teeth free, tossed them over his shoulder. Even as the teeth fell the old man rose. He began to stroke. To swim up and up and up, moving like a pale, pink seal among the fish. 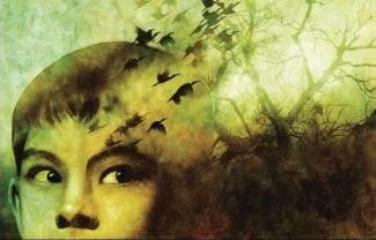 In the light of the moon the young man could see the pooched jaws of the old man, holding the last of the future’s air. Up went the old man, up, up, up, swimming strong in the long‑lost waters of a time gone by. The young man began to strip off his own clothes. Maybe he could nab him, pull him down, put the clothes on him. Something… God, something… But, what if he couldn’t come back? And there were the fillings in his teeth, the metal rod in his back from a motorcycle accident. No, unlike the old man, this was his world and he was tied to it. There was nothing he could do. A great shadow weaved in front of the moon, made a wriggling slat of darkness that caused the young man to let go of his shirt buttons and look up. A black rocket of a shape moved through the invisible sea: a shark, the granddaddy of all sharks, the seed for all of man’s fears of the deeps. And it caught the old man in its mouth, began swimming upward toward the golden light of the moon. The old man dangled from the creature’s mouth like a ragged rat from a house cat’s jaws. Blood blossomed out of him, coiled darkly in the invisible sea. The young man trembled. “Oh God,” he said once. Then along came that thick dark cloud, rolling across the face of the moon. Momentary darkness. And when the cloud passed there was light once again, and an empty sky. Just the night, the moon, and the stars. 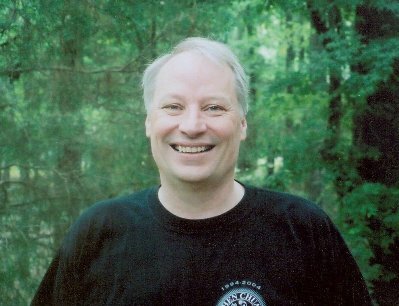 Visit Joe R. Lansdale HERE. 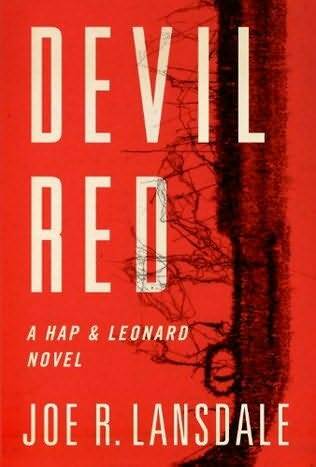 Devil Red: The newest in the Hap and Leonard series. 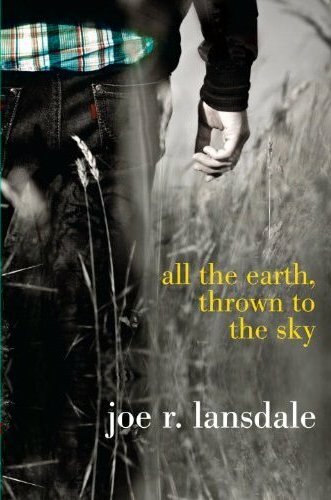 All the Earth, Thrown to the Sky: Jack Catcher's parents are dead—his mom died of sickness and his dad of a broken heart—and he has to get out of Oklahoma, where dust storms have killed everything green, hopeful, or alive. When former classmate Jane and her little brother Tony show up in his yard with plans to steal a dead neighbor's car and make a break for Texas, Jack doesn't need much convincing. 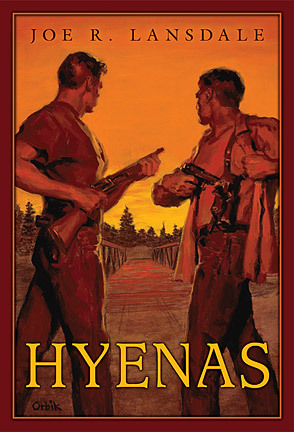 But a run-in with one of the era's most notorious gangsters puts a crimp in Jane's plan, and soon the three kids are hitching the rails among hoboes, gangsters, and con men, racing to warn a carnival wrestler turned bank robber of the danger he faces and, in the process, find a new home for themselves. This road trip adventure from the legendary Joe R. Lansdale is a thrilling and colorful ride through Depression-era America.